Bidzina Ivanishvili (Georgian: ბიძინა ივანიშვილი, also known as Boris Ivanishvili; born 18 February 1956) is a Georgian businessman and politician who was Prime Minister of Georgia from 25 October 2012 to 20 November 2013. He founded and led the Georgian Dream coalition, which won the 2012 parliamentary election. After the 2013 presidential election, he voluntarily resigned both his government and party positions, naming his long-time personal assistant Irakli Gharibashvili as his successor. On 26 April 2018, the incumbent chairperson of the Georgian Dream-Democratic Georgia party, PM Giorgi Kvirikashvili, announced that Ivanishvili would return as chairperson. Dual citizen of Russian Federation and Georgia, latter granted by Saakashvili, In March 2010, Ivanishvili was granted another trio French citizenship. In October 2011, he was deprived of his Georgian citizenship "according to Article 32 of the Georgian Law on Citizenship", shortly after he had announced his intention to form a political party to challenge Georgian President Mikheil Saakashvili. In March 2012, Ivanishvili was ranked at number 153 in Forbes magazine's annual list of the world's billionaires with an estimated worth of $6.4 billion, making him Georgia's richest person. Bidzina Ivanishvili was born the youngest of five children to a poor family in the Georgian village of Chorvila. His father worked in a manganese factory. He graduated from high school in Sachkhere and went to Tbilisi State University to study engineering and economics. In 1982, he went to Moscow to pursue a PhD in economics at the Moscow State University of Railway Engineering. Prior to 1990 while living in Moscow, Ivanishvili met Vitaly Malkin, a Russian businessman currently into politics, with whom he formed a partnership selling computers, and later importing what was then a novelty in Russia, push-button telephones. The source of his great wealth is metals and banking. Forbes magazine's description of the secret of his success could apply to dozens of other oligarchs in Russia: "He bought firms not needed by anybody for tens of millions of dollars and sold them for billions of dollars." In 1990 he and Malkin set up "Rossiysky Kredit", which is up to now Ivanishvili's biggest holding. Over the years, he sold other businesses accumulated by him during the privatization era in Russia, investing the proceeds in the Russian stock market. He has also interests in hotels, including Hotel Lux, and in a Russian chain of drugstores called "Doctor Stoletov". He is also redeveloping a former factory in downtown Moscow into a deluxe housing project, the first blocks of which are to be completed by 2012. 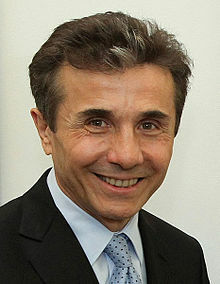 In March 2010, Ivanishvili ranked 173 in 2010 Forbes List of Billionaires, with a reported net worth of 4.8 billion USD. The following year he ranked 185 in the 2011 Forbes List with a reported net worth of 5.5 billion USD. In March 2012, he ranked 153 in the 2012 Forbes List with a reported net worth of 6.4 billion USD; with his total net worth equaling one third of Georgia's Gross Domestic Product. Ivanishvili's residence in Tbilisi, designed by Shin Takamatsu. In April 2012, Ivanishvili established the Georgian Dream–Democratic Georgia party with the intention to challenge the ruling United National Movement in the parliamentary election scheduled for October 2012. The Georgian Dream coalition is composed of the Republican Party of Georgia, Our Georgia – Free Democrats, the National Forum, the Conservative Party of Georgia and the Industry Will Save Georgia party. The head of the latter party publicly acknowledged in April 2012 that he doesn't share all of Ivanishvili's views on foreign policy, especially when it comes to joining NATO. On 11 June 2012, a USD 90.9 million fine was imposed on Ivanishvili for alleged violation of the Georgian legislation on party funding. Ivanishvili is also under investigation on charges of using his companies Burji, Elita Burji, and Global Consulting Group for political and electoral goals. In the Offshore leaks revelations of ICIJ about global offshore networks Ivanishvili is mentioned among the most prominent figures. The documents show, that he has been director of the front company Bosherston Overseas Corporation in the British Virgin Islands (2006), a front company which still exists. The premier did not deny this and his spokesman commented: "For the reporting period of 2011–2012 Prime Minister Ivanishvili had no interest in the company you have mentioned in your inquiry and therefore there was no obligation to report it in his declaration. The Prime Minister takes these reporting requirements seriously and everything is done according to the law". Although Ivanishvili officially retired from politics in late 2013, he continues to have influence on Georgian Dream. According to political scientist Kornely Kakachia, he is "outside democratic control, outside institutional checks and balances, yet he is ultimately calling the shots, which puts Georgia in a vulnerable position both vis-à-vis democracy and foreign policy." Ivanishvili owns several estates, including a mansion above Tbilisi which is worth an estimated US$50 million and specially designed for him by Russian architect Mikhail Khazanov and finished by famous Japanese architect Shin Takamatsu. Ivanishvili is also known by the Russian first name Boris, which he previously used while working in Russia. He was widely reported under that name in the West. However, he went back to his Georgian first name Bidzina in 2011. Recently Ivanishvili became the subject of some interest in the art world, following his reported purchases of works by Pablo Picasso and the contemporary artist Peter Doig at international auctions. Ivanishvili bought Niko Pirosmani's Arsenal Hill at Night, paying a record US$1.5 million for a painting by a Georgian artist. He then donated the painting to the State Museum of Arts of Georgia. Ivanishvili is married to Eka Khvedelidze. Two of his three sons have albinism, including Bera, a well-known singer and rapper in Georgia. "Georgian Dream" is a rap song by Bera and became an inspiration to his father who named the party he founded in 2012 Georgian Dream (full name Georgian Dream–Democratic Georgia) after his son's rap song. ^ "Georgia's president admits defeat in elections". RTÉ. 2 October 2012. Retrieved 7 October 2012. ^ "Ex-PM Ivanishvili to Chair Georgian Dream Party". Civil Georgia. 26 April 2018. Retrieved 28 April 2018. ^ "Buryatia Senator Richest in Russian Upper House". RIA Novosti. Retrieved 7 October 2012. ^ David M. Herszenhorn; New York Times (27 October 2013). "Georgia Elects New President, but Real Power Will Rest With Next Premier". nytimes.com. ^ Ivanishvili's Political Party Launched. Civil Georgia. 21 April 2012. Accessed 12 May 2012. ^ "Industrialists Party Joins Ivanishvili-Led Coalition". Civil. Retrieved 7 October 2012. ^ "Ivanishvili Fined with USD 90.9 Million". Civil. Retrieved 7 October 2012. ^ 6 July 2012. "Announcement of the Financial Monitoring Service". Control. Retrieved 7 October 2012. ^ Lomsadze, Giorgi (13 November 2014). "Georgia: Political Crisis Prompts Speculation About Ivanishvili's Political Role". eurasianet.org. Open Society Institute. ^ Julia Ioffe (16 February 2012). "Bidzina Ivanishvili's Big House". Forbes. Retrieved 7 October 2012.